BMWC 9 was held in Spring of 2007 in Českomoravská vrchovina (“Czech-moravian highlands”), in Vanov. At this BMWC, we have tried a cottage camp for children as a means of accommodation. It proved a bad idea because of a very cold weather. The positive aspect of this was, however, a better and closer contact with nature. BMWC 9 was the first conference with an increased number of rituals. That included a ceremonial start and an end of the conference in a form of rituals. The agenda consisted from e.g. a Germanic rite and a thor blot which took place during the male workshop. There were around thirty participants. BMWC 9 was yet another step from theory to practise. 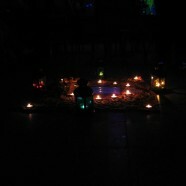 Apart from rituals, there were many workshops aimed at personal experience, massages, shamanism etc.